The people of the island have always lived off what the sea saw fit to give them. As much as we can, we are keeping this relationship alive, made up as it is of simple gestures and sincere flavours. Our philosophy: simplicity in tradition. 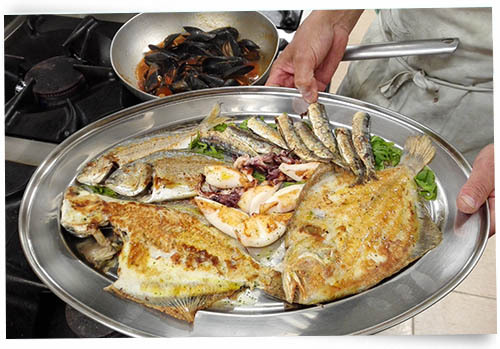 At l'Approdo, we don’t use artifice to change the flavours of our fresh fish! There’s no need because, being fresh, it keeps all the taste of the sea. We only allow ourselves the luxury of adding a drizzle of extra-virgin olive oil and some parsley to the fish after its cooked. "I offer clients fish which I have personally selected that same morning in the port market. After a night out in the open sea, the fleet of trawlers returns to Grado at around nine in the morning. Like an ancient daily ritual eking out the days of the island, the fish arrives into the port market, once the beating heart of village life. I wake up early, before the sun has risen high in the sky, and hurry to check the fish of the day. As I choose the best specimens for the restaurant, I can already taste the flavours which will soon spring from them in the kitchen. For me, it’s a real passion to spoil my clients, much like when you have friends round." 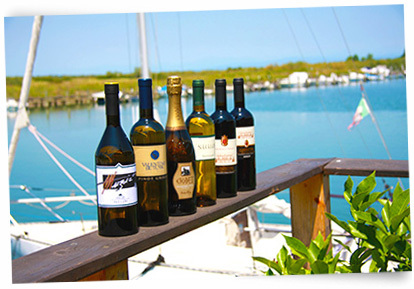 What about an excellent wine to accompany the fish we are so passionate about? We also offer home-grown products when it comes to wine. Our selection comes from the wonderful area of Collio and if you want to finish off with a grappa, we have some made in nearby Aquileia. Work parties, ceremonies, weddings?We can accommodate groups of up to 80 people.